Fans of the CW's Smallville should look to Superman comics to see where the ninth season will take them... including the current World of New Krypton storyline, and some potentially disastrous fashion choices. Spoilers! the thread of the year is twofold. One is Clark training with Jor-El and for the first time ever embracing what that means to be a hero, trying to give up his human identity but finding how hard that is when you're in love with somebody, and so that's kind of the thread, between Lois and Clark and the Blur, and his training with Jor-El, that's kind of the thread. It's kind of based on a couple of pieces of mythology of when he died, and his Doomsday fight in the comics, and the costume he wore after that, and that's kind of the basis of what we're doing with his look this year. 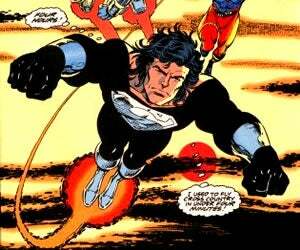 We're bringing him in as Major Zod, and we have a whole backstory that's going to unfold as to why he's here. He comes with pretty much a legion of Kryptonians from Kandor, and so it dovetails and touches on what they're doing in the comic world right now. For those not reading the Superman comics, that means an army of Kryptonians on Earth under the command of Zod, who may or may not be a threat that even Superman can't take care of. Will Clark have to deal with kneeling before more than one superpowered troublemaker from his home planet before the end of the season? It's looking likely, but it's also likely that he's not going to be doing it alone; the producers also confirmed that comic writer Geoff Johns will be writing an episode of the season, introducing elder statesmen superheroes the Justice Society of America. Smallville returns for the start of its ninth season on September 25.